One of the most rewarding experiences I’ve had thus far is learning The Way of Sao. 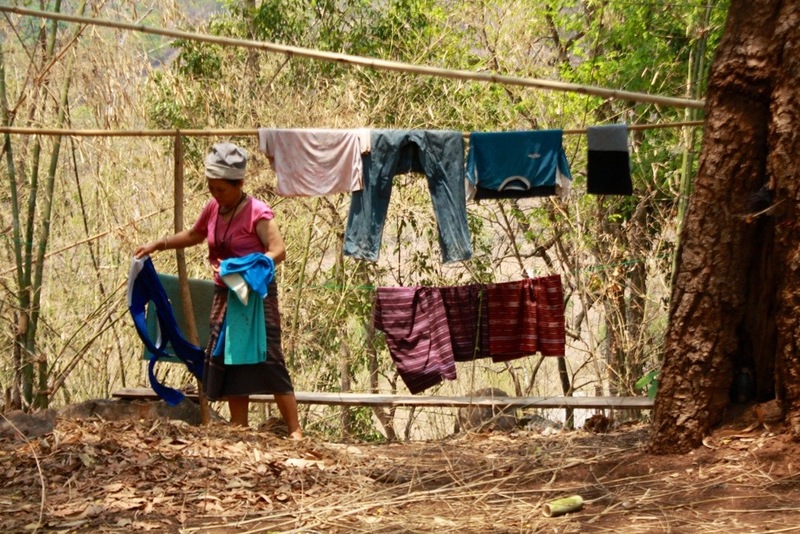 For 10 days, we became part of a Karen hill tribe family volunteering in the mountains of northern Thailand. 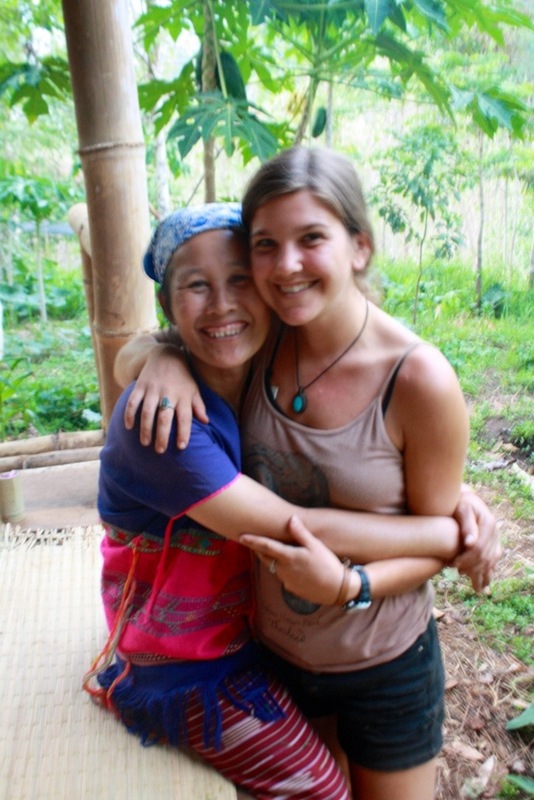 Our motivation was education through immersion, as we were both interested in learning more about hill tribe culture from a non-touristic perspective. 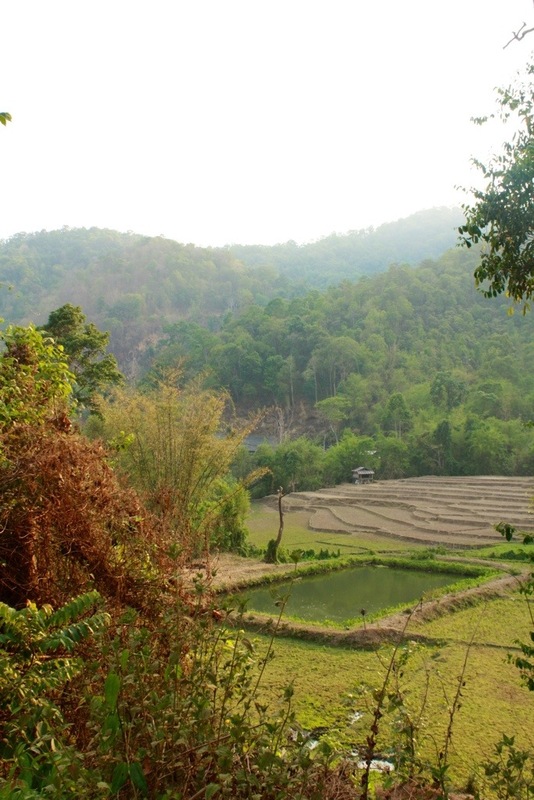 (Treks and tourist visits are offered to go and ‘see’ certain hill tribes, but we found this to be a bit strange and inauthentic). 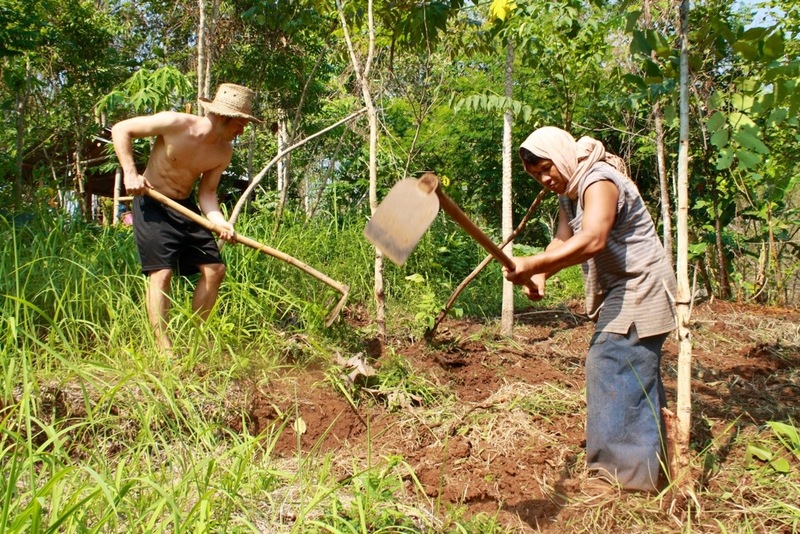 We wanted to get to know the people we were staying with and to get our hands dirty learning sustainable permaculture tips and techniques. 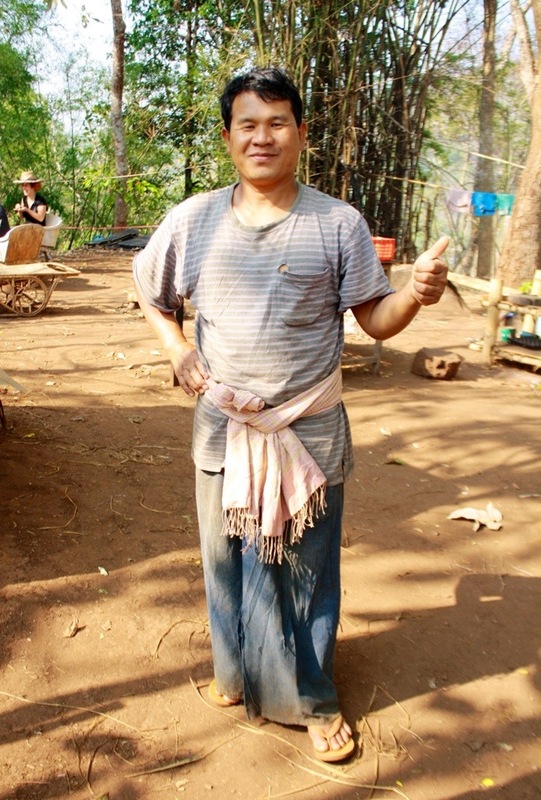 We stayed with a hilariously quirky and jovial man named Papa Sao and his hardworking, lighthearted wife, Momma Suwanee, who often erupted into uncontrollable bursts of laughter at random. 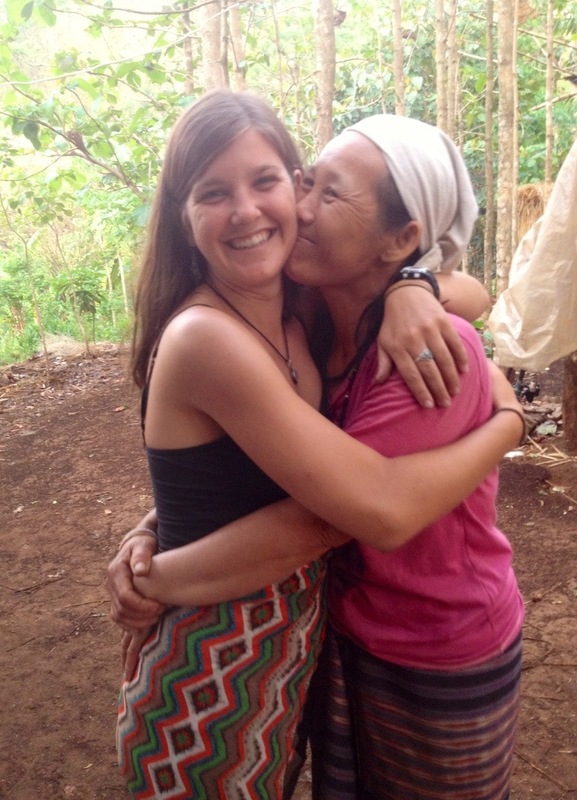 They accepted us as their own, along with a handful of other volunteers who came and went while we stayed there. 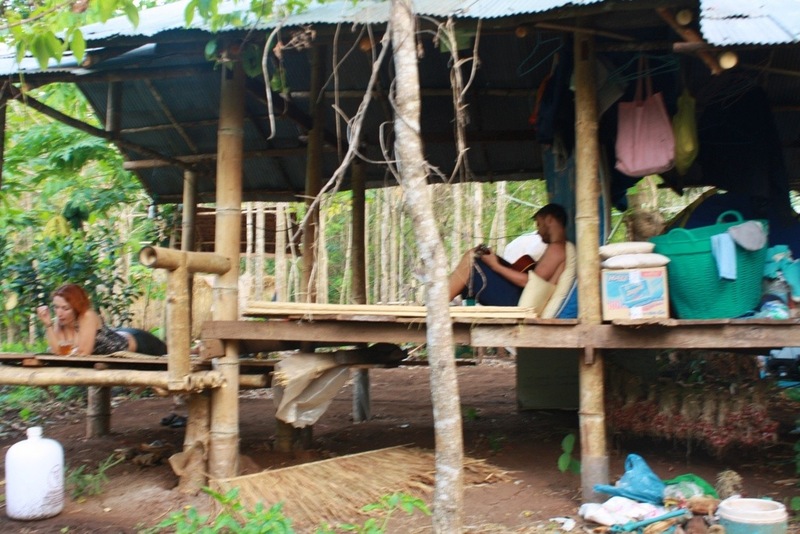 We had originally planned to visit here for only a few days and then to move on to another farm nearby, but we fell so in love with the people and the lifestyle of this Karen family that we stayed here the entire time. 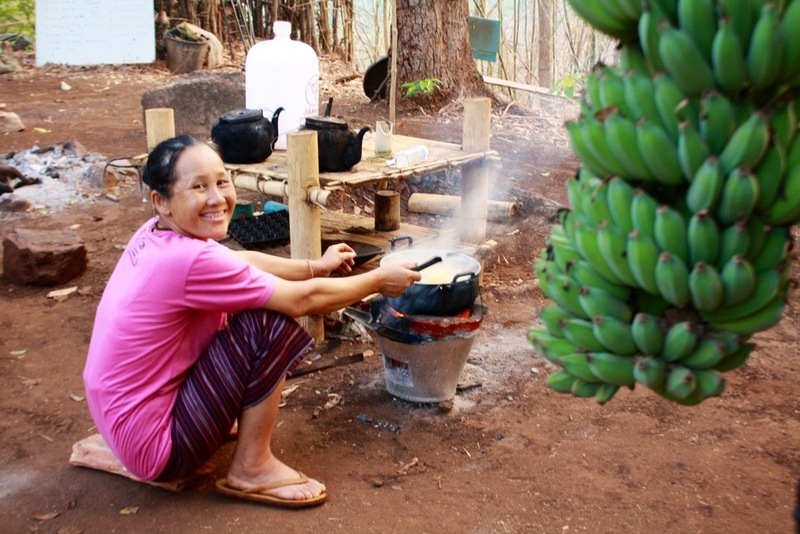 At Sao’s organic farm, in a village called Khun Sap, there is an outdoor kitchen, a community space centered around a campfire, acres and acres of bamboo forests, and many homemade bamboo bungalows perched high on a hill overlooking the surrounding mountains and rice paddies. 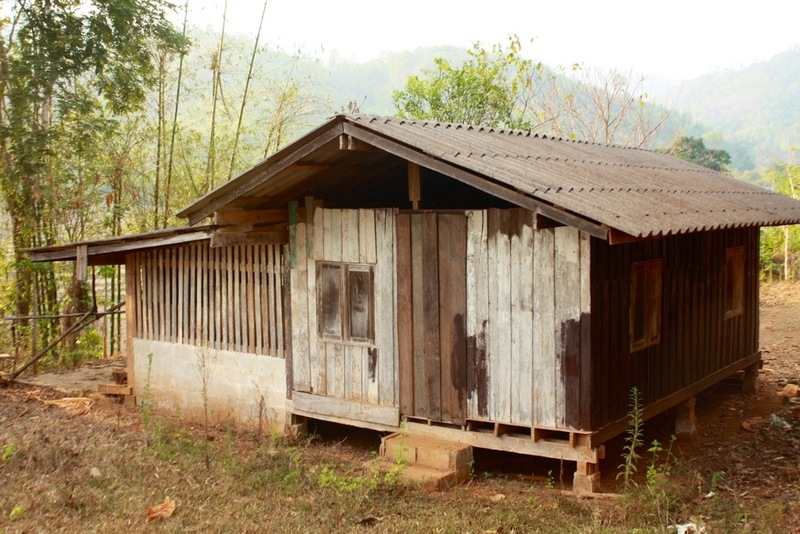 When we arrived, many volunteers were occupying the bungalows so we stayed a little farther down the hill in an old rotary club building that we called “the scout house.” The accommodations were simple; we slept on the floor with a few blankets and had a squat toilet and a bamboo shower. Our days began at 7:30am: We roused and headed to the hill for breakfast that was hot and ready for us by 8am. 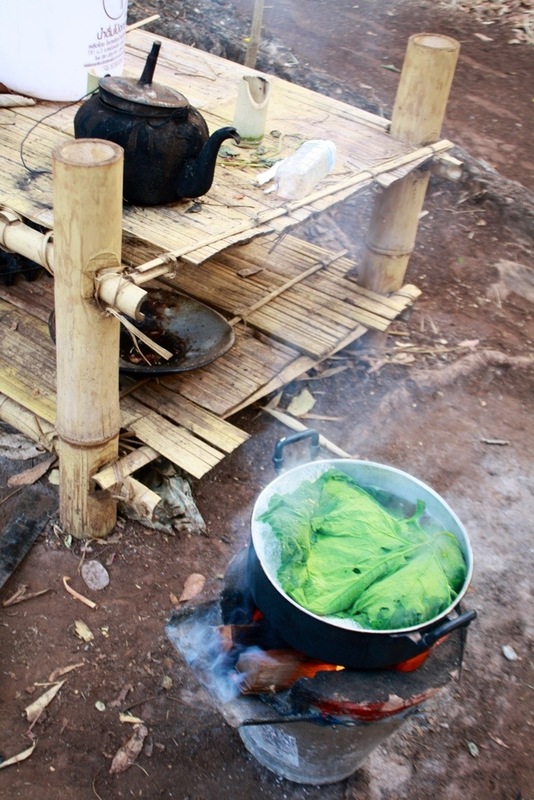 Breakfast was always made from fruits, veggies, plants, and herbs from Sao’s farm and served with rice and coffee. 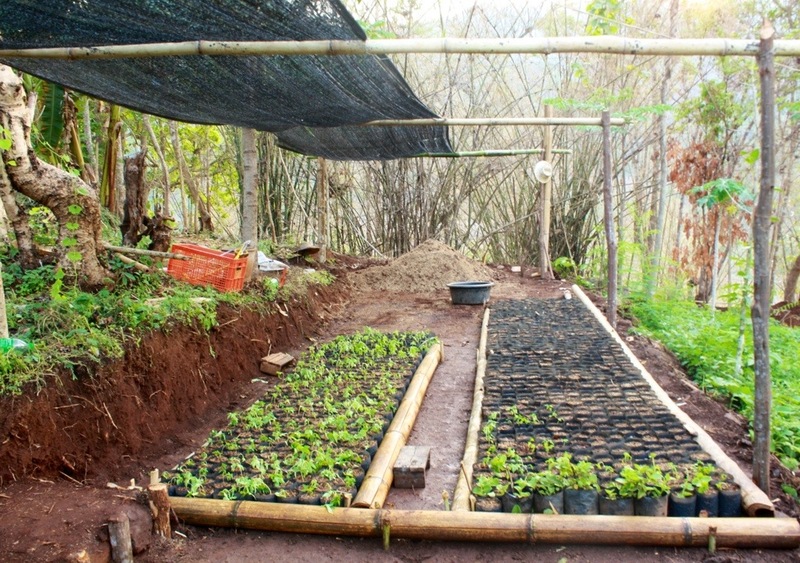 After breakfast, we usually worked in the newly-built papaya nursery. 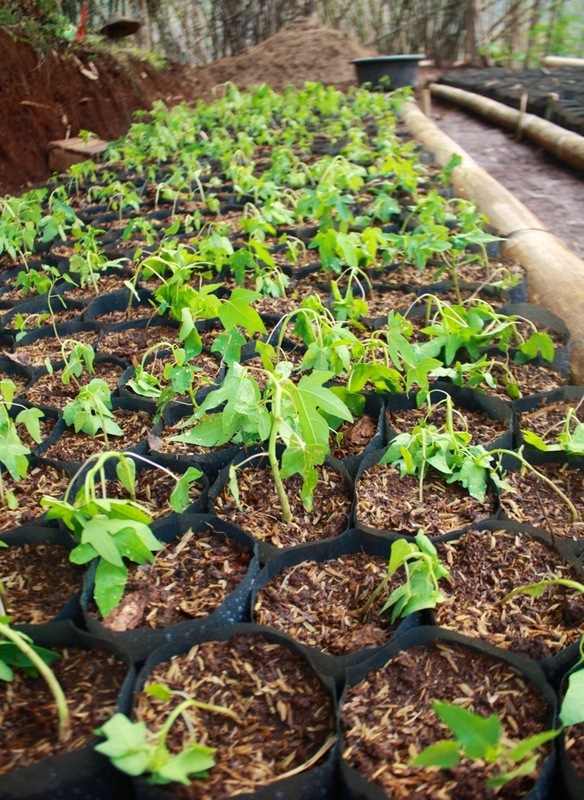 We unearthed papaya seedlings that had sprouted haphazardly from papaya trees near Sao’s home and replanted them in compost (pig manure, rice chaff, and dirt) pots and aligned them in the nursery. 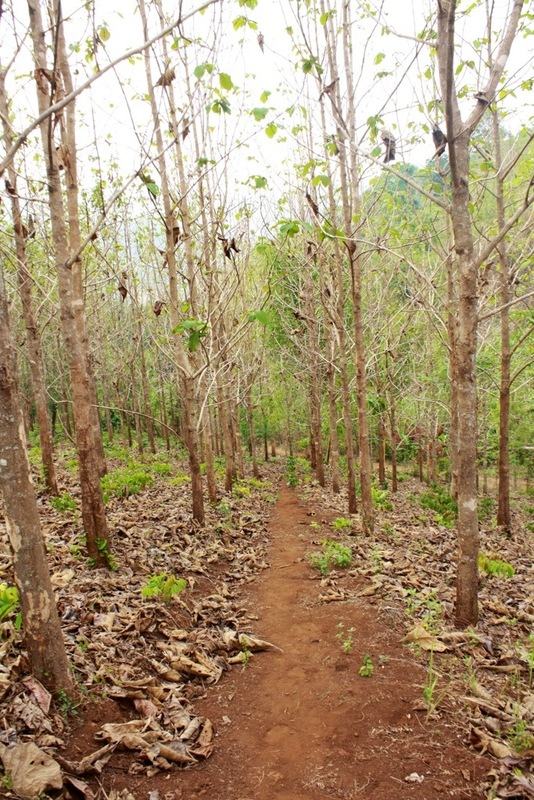 After some watering and tending, Sao will relocate them to a bigger area of land nearby to create a papaya forest. 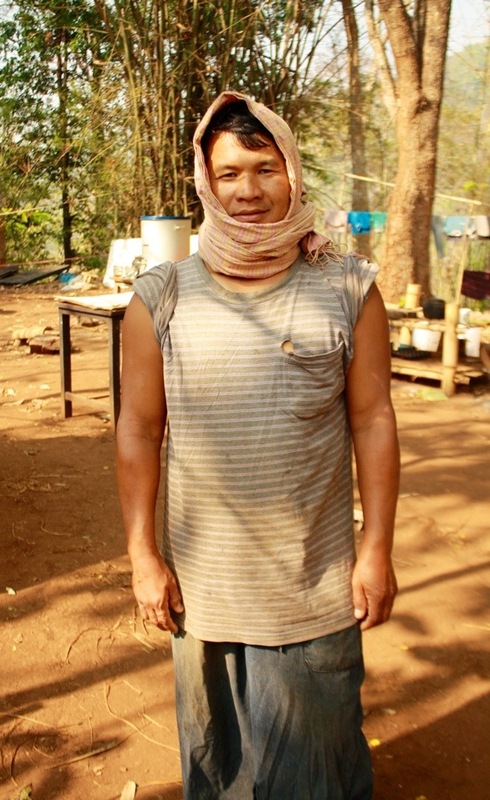 We planted approximately one thousand papaya trees, and they begin bearing fruit in about 3 or 4 years, so Sao and his family should have a plentiful supply of papaya well into the future! We would take breaks often, in fact “take a break” was one of Sao’s favorite phrases. The instant he saw me wiping my brow of sweat or taking a second to rest, he would joyously exclaim, “Take a break, take a break! Teacha Jos, drink coffee, drink tea, drink coffee, drink tea!” And so “breaktime” occurred regularly, beginning around 11 am and usually lasting until hours after our noontime lunch. After lunch, we would read, write, enjoy life. At 3 pm, we would resume work or other various activities. Sometimes we would run errands around the village with Mr. Sao, meeting his friends and familiarizing ourselves with village life. 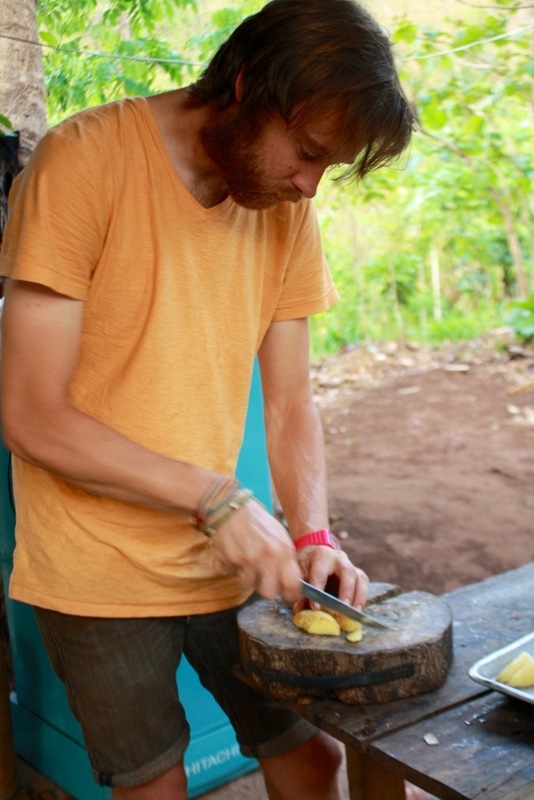 We watched his sister make fabric from a homemade loom, picked up a bottle of local honey from his friend who owned a beehive, picked and ate fresh tamarinds and mulberries. 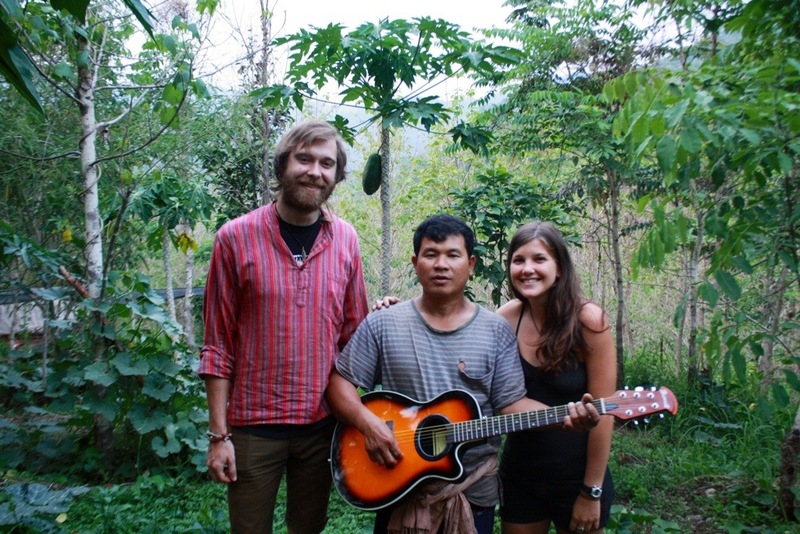 Sometimes Mr. Sao took us on adventures through rice fields and to waterfalls, teaching us about the medicinal properties and practical purposes of the plants we encountered along the way. 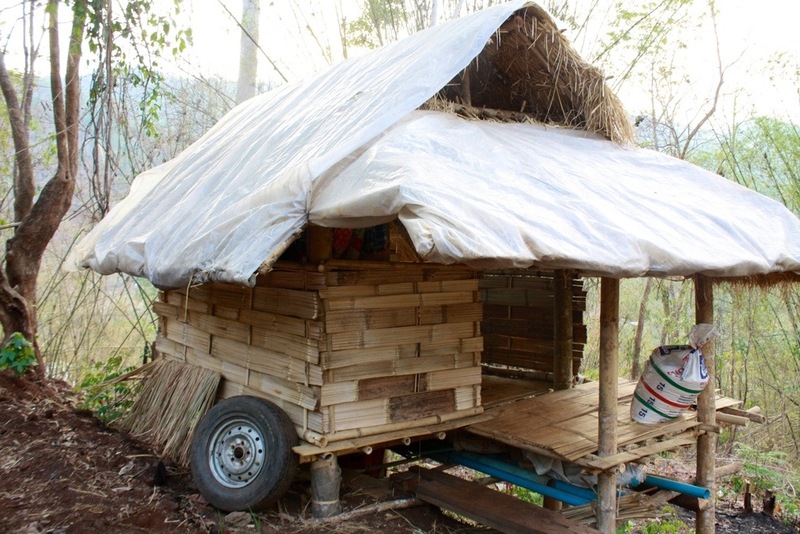 We learned just some of the infinite uses of bamboo. 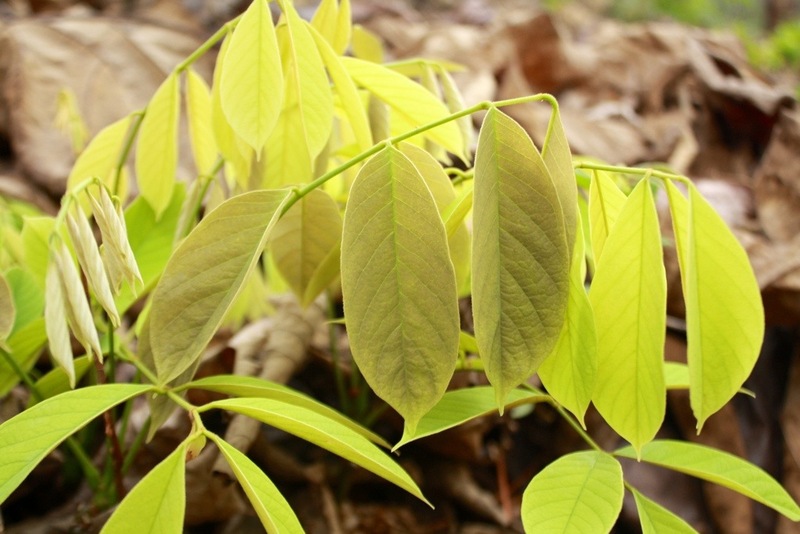 Sao and Suwannee use this wondrous plant to make houses, chairs, fires, shovels, drinking cups, lunch and dinner, showers, cell phone towers, and didgeridoos. 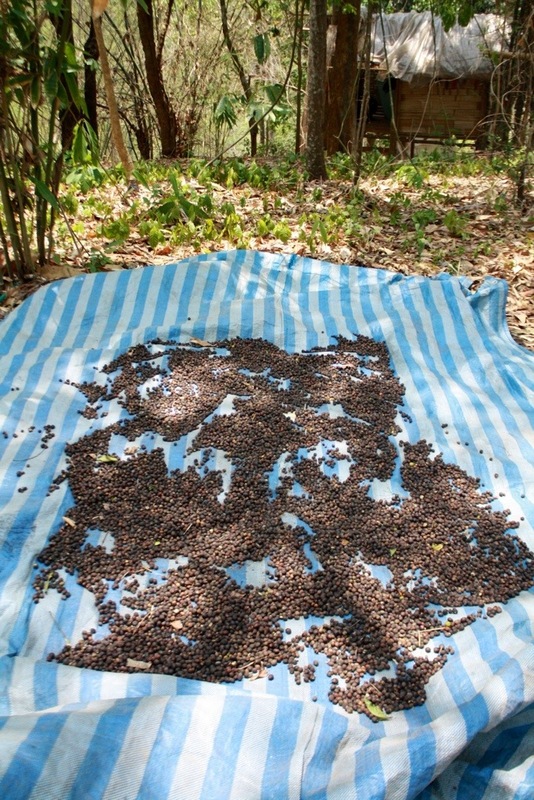 We spent many afternoons picking coffee beans from the coffea trees nearby on Sao’s land. 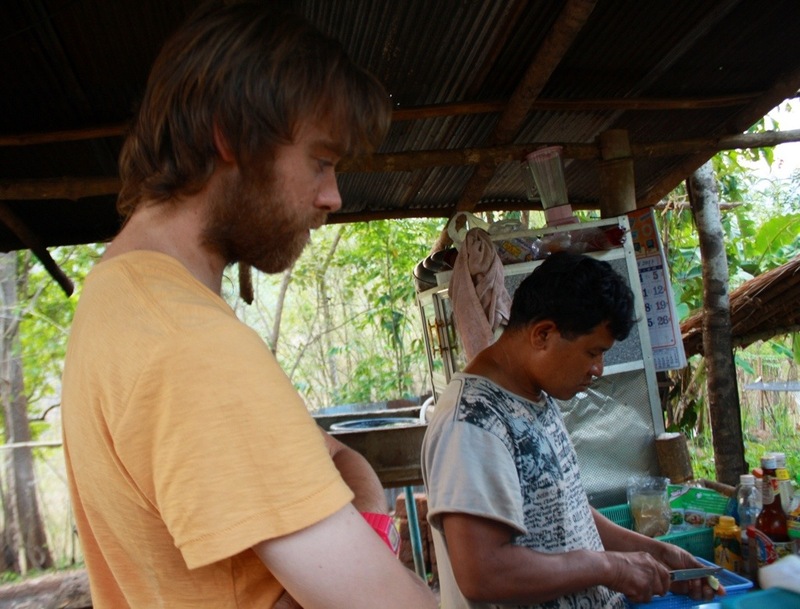 After 5 or 6 of us filled our bags, we went back to home base to begin the meticulous and time-consuming, yet satisfying process of preparing our own coffee. First, we sorted the beans, keeping the brown beans and setting the red and green beans aside until they became ripe. We then roasted the brown beans, shelled them, and roasted them again on an open fire. 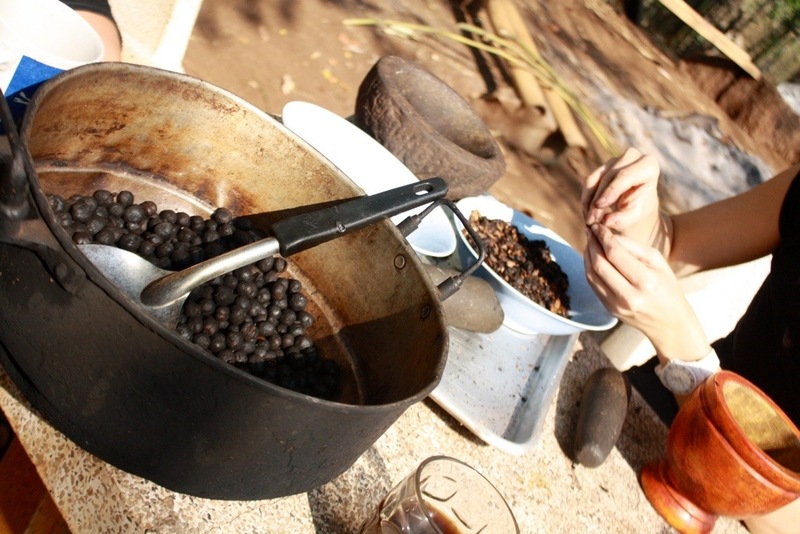 We took turns grinding the beans with a mortar and pestle, the very last step. 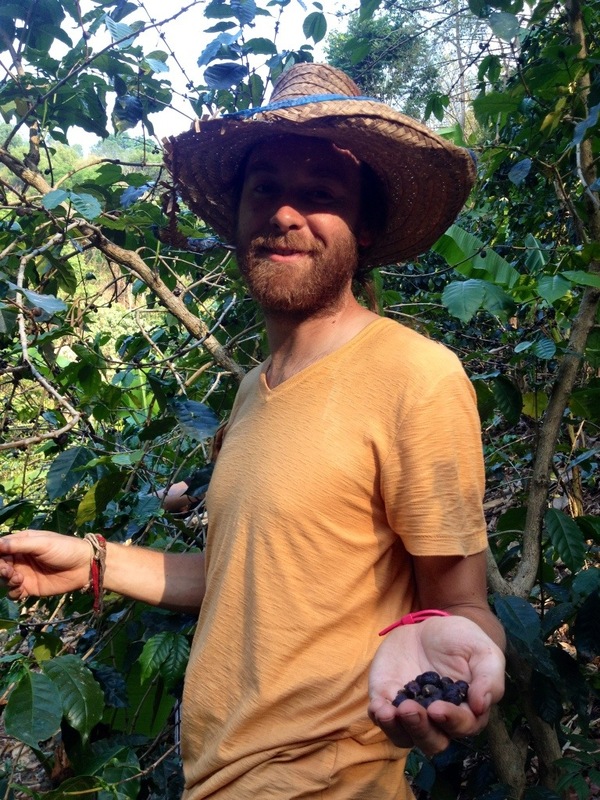 Every morning we enjoyed steeping the grounds and sipping a rich cup of coffee, the reward for all our hard work. 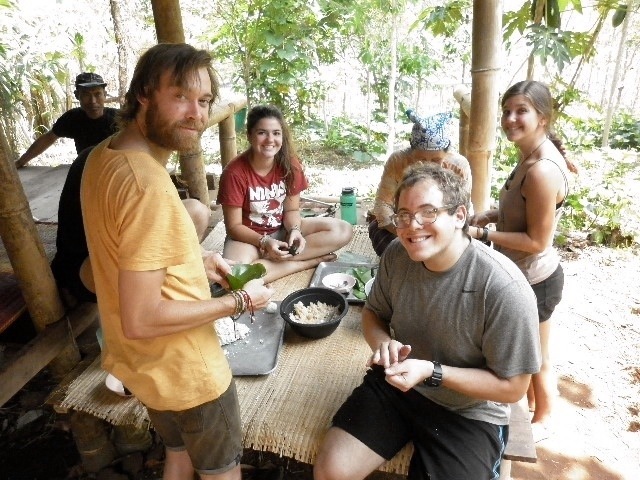 On other afternoons, we would help Sao and Suwannee by chopping veggies, folding sticky rice in banana leaves (Khao Lam), or foraging for fruits and fungi. We always ate like kings. 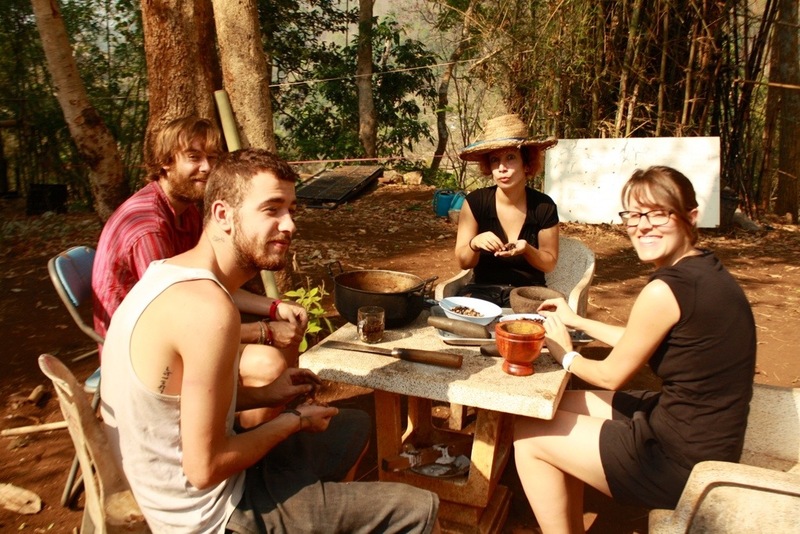 Our meals were copious and regularly included stewed feasts of mango, papaya, bamboo, cabbage, morning glory, curries, jack fruit, mushrooms, and, of course, rice. As keen as Sao was to teach, he was even more enthusiastic to learn. He started studying English a year ago, was self-taught from a book and well on his way to being fluent. I spent many nights teaching him random English words like “import” and “export,” and he spent the entire next day compulsively repeating them and using them in context. One of his favorite English phrases, which he would repeat every night before dinner, was “Everybody, not every people, dinner is ready.” He had made that grammatical mistake once, and was determined not to make it again through repetition and humor, for every time he said “everybody, not every people,” he started cracking up. Every time he taught us something new he would say, “learning by doing,” an expression that he had obviously learned recently and taken a liking to. 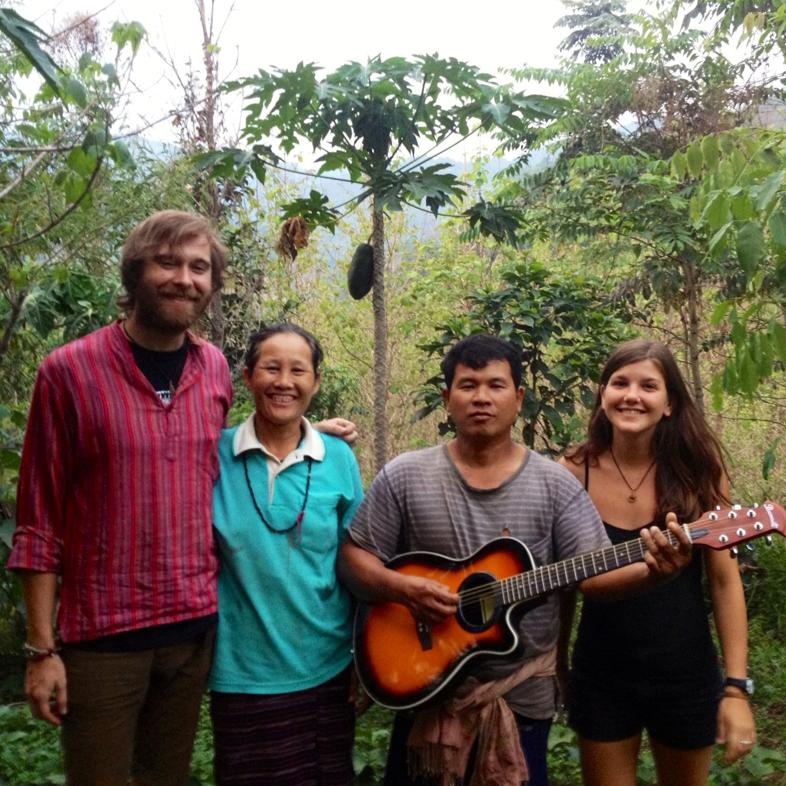 Most evenings we spent around the campfire; Sao would sing Karen songs and play guitar while we shared our lives with other travelers. If we were lucky, we’d get a visit from a fellow villager. One of them became quite fond of ‘Teacher Boy’ (Sao’s nickname for Ryan). 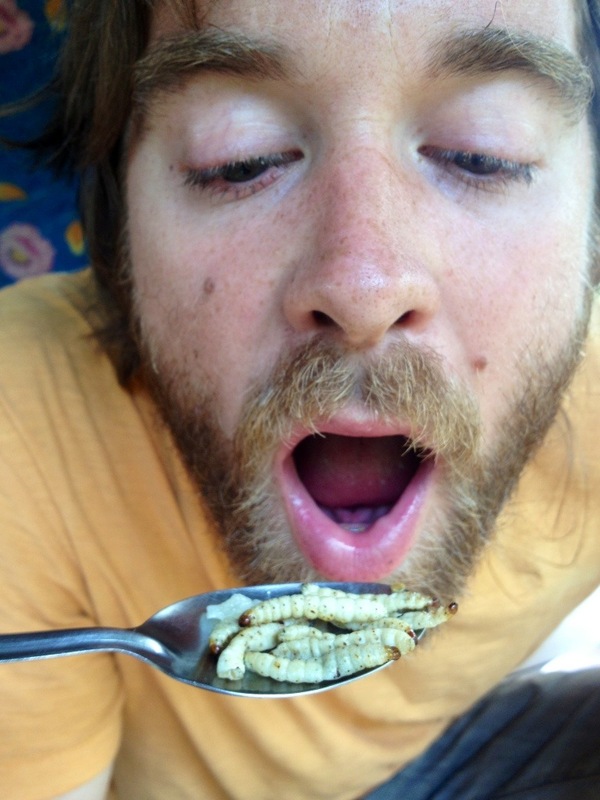 Obsessed with Ryan’s beard, the villager kept touching his face and decided that he would give him a ‘traditional Thai massage.’ The ‘massage’ consisted of the villager forcefully tugging his limbs in opposite directions, and Ryan, with a pained expression on his face, alternating between groans and nervous laughter. One night, Sao led Sue, Ryan and me in a walking meditation. We walked barefoot in small, slow circles with eyes closed, and hands folded on top of each other at our waists. 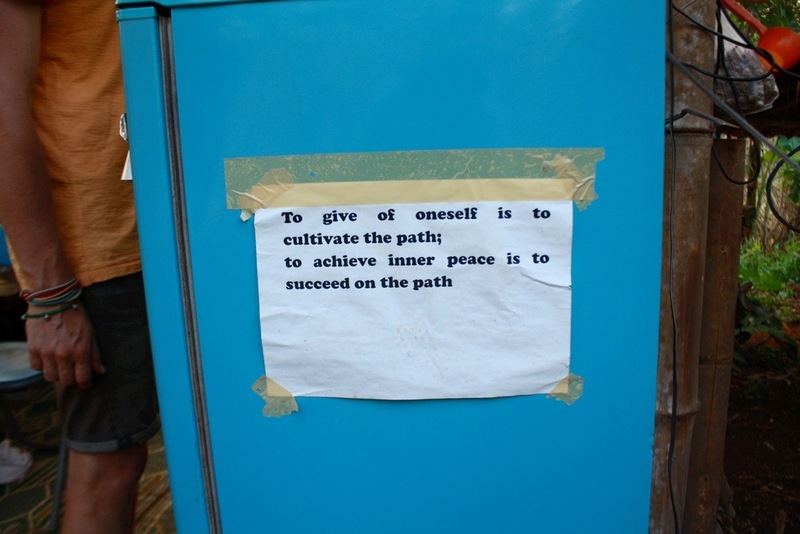 The philosophy Sao espoused was simple: live in harmony with the land around you, teach what you know, learn what you can, and laugh at anything and everything. I am forever grateful for this much-needed respite from city life and for the unbelievable warmth shown to us by Sao and Suwannee. To be surrounded by beautiful mountains and people, relaxing and reflecting, whilst still helping others and earning your keep is to feel real peace. 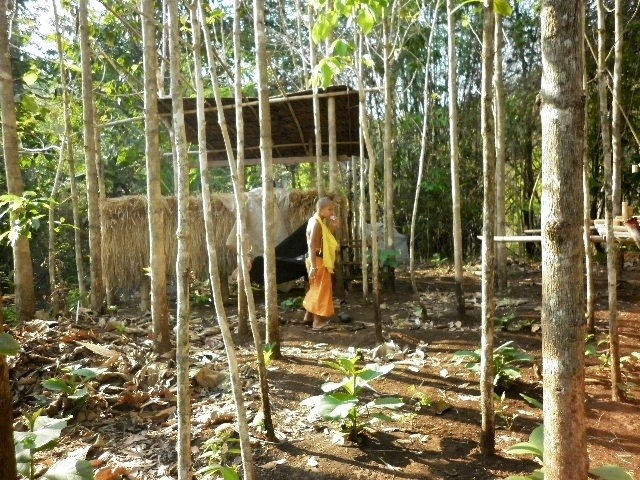 An example of one of the bamboo huts many volunteers stayed in. 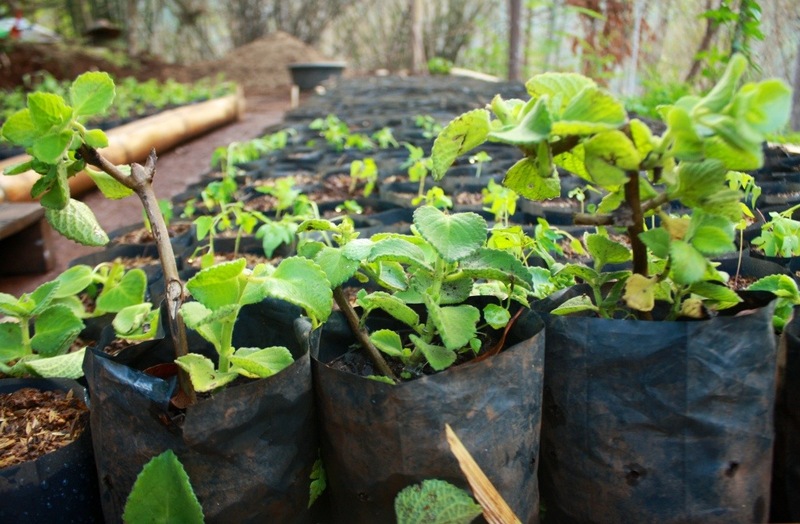 Thai mint and papaya in the nursery. 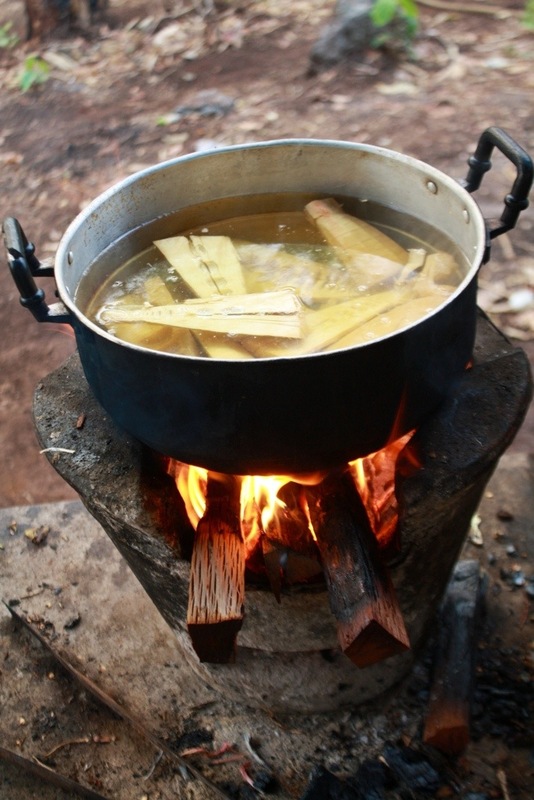 Bamboo shoots cooking for dinner. Teacher Boy cutting some potatoes. 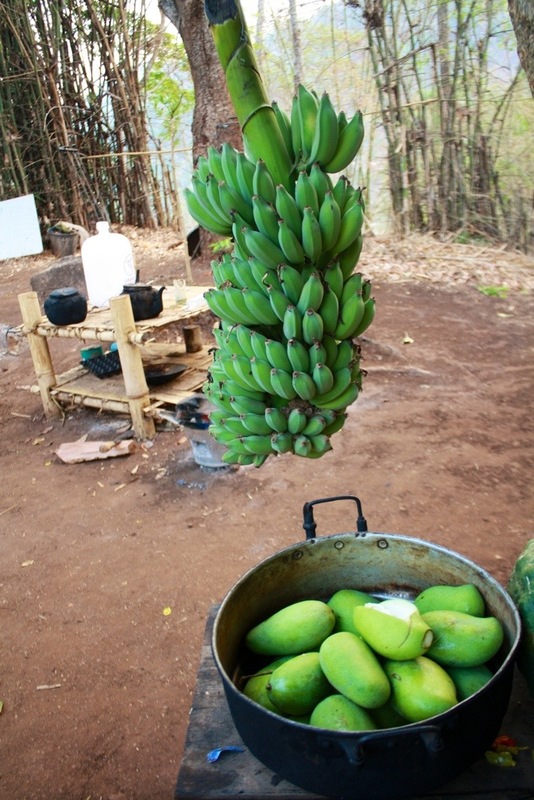 Unripe bananas and mangoes. 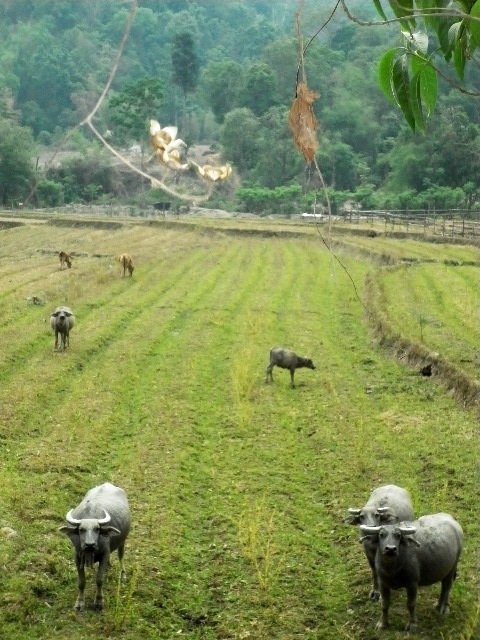 The mangoes we would eat as is, in Thai favorites such as Som Tam. The bananas would need a few more days. Teacher Boy chopping potatoes for dinner. 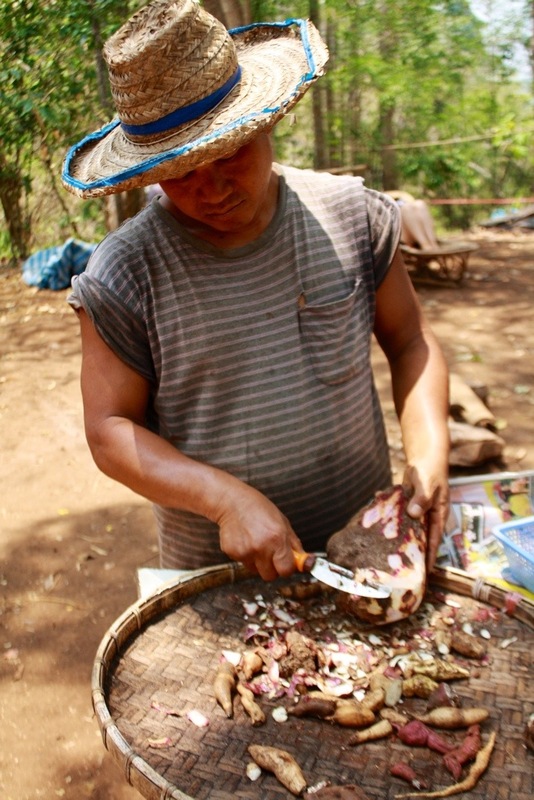 Sao making “nam prik,” or chili paste, for dinner. Boiling morning glory with tea kettle. Momma Suwannee tending the fire. Teacher Boy, Teacher Jos, and Papa Sao, mid-song. 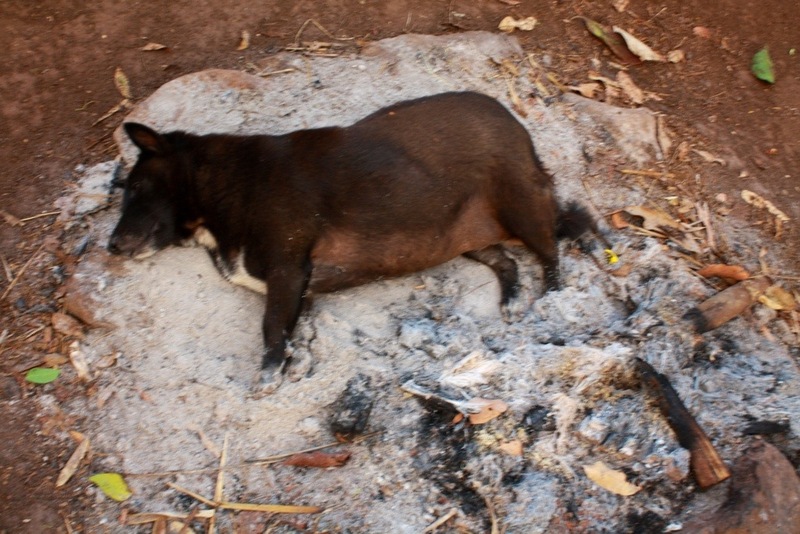 Molly, the family pig dog, who always slept in the fire’s ashes for warmth at night. 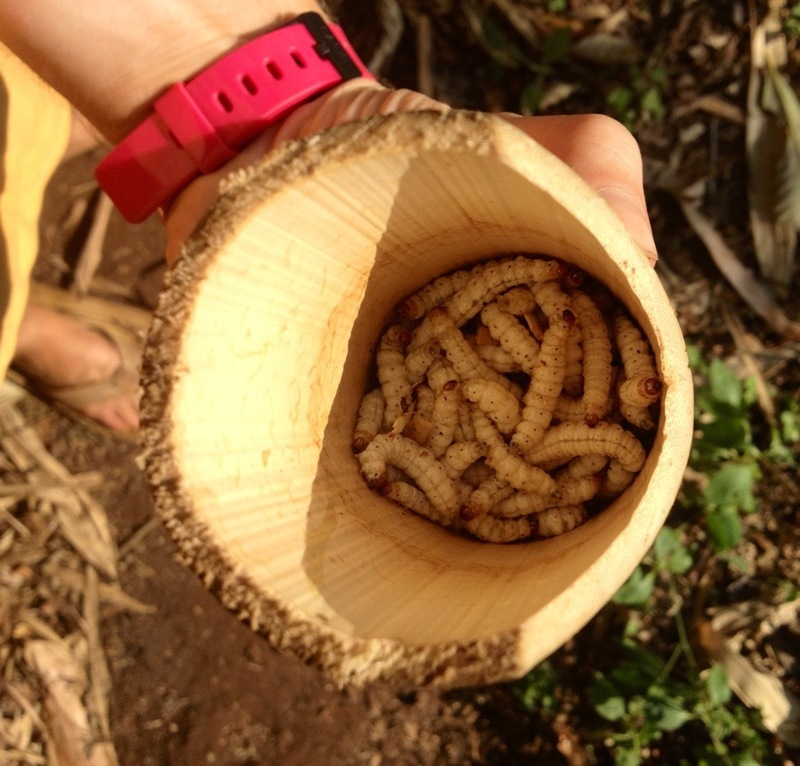 Momma Suwannee identified the hiding spot of these caterpillars immediately after spotting the chewed holes in some bamboo stalks nearby. 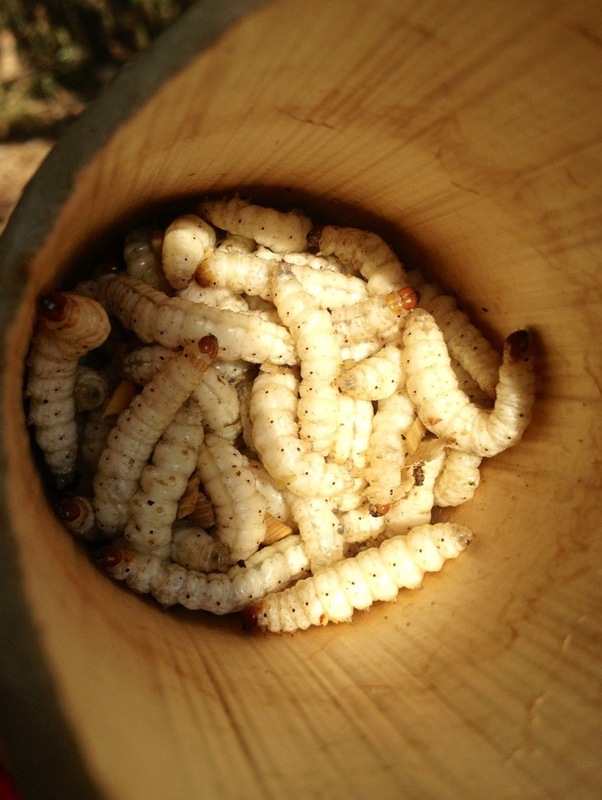 She promptly chopped down the bamboo and fried up the larvae for dinner. 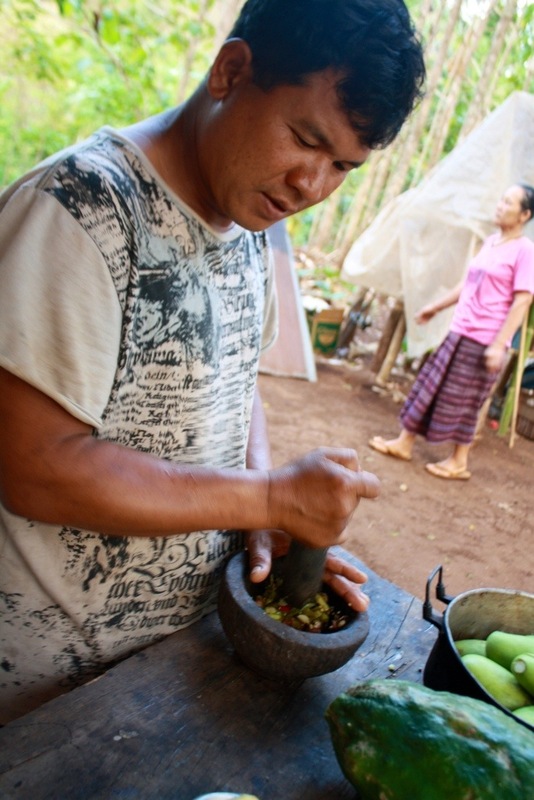 Making Khao Lam, a sweet sticky rice snack. 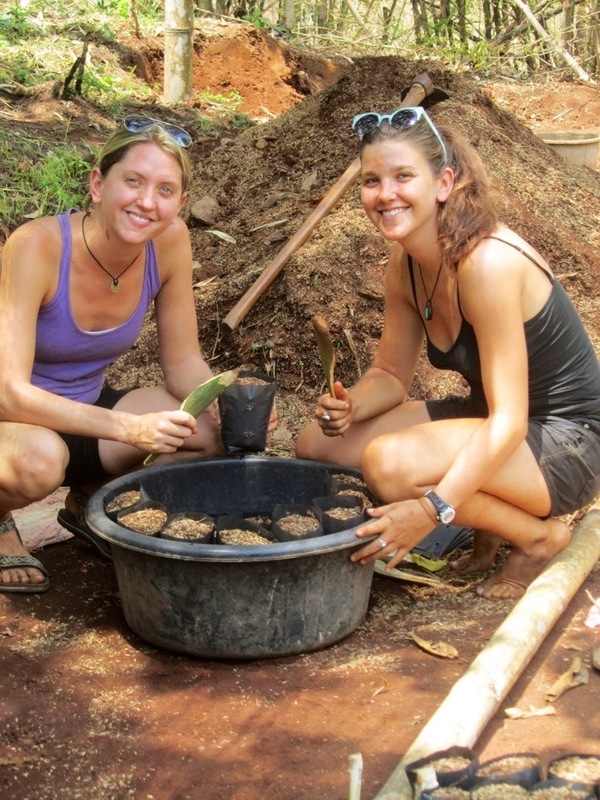 Katie and me shoveling poo for the papayas. 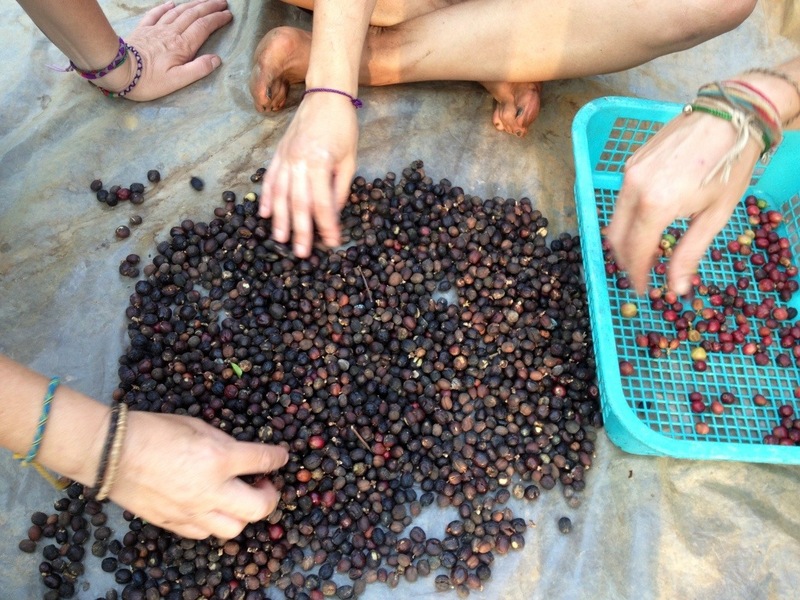 Sue, Lilith, and Teacher Boy sorting coffee beans. Sorting the browns from the red and the greens. 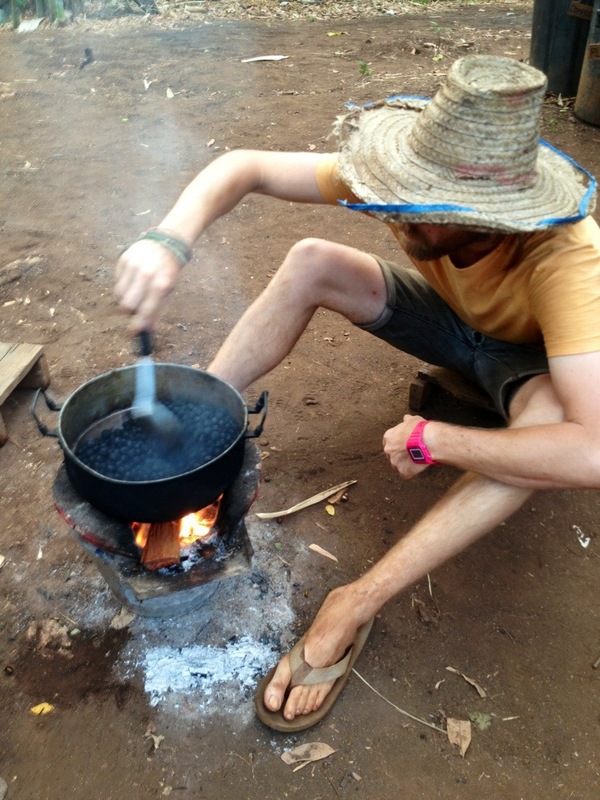 Teacher Boy roasting coffee beans on the fire. 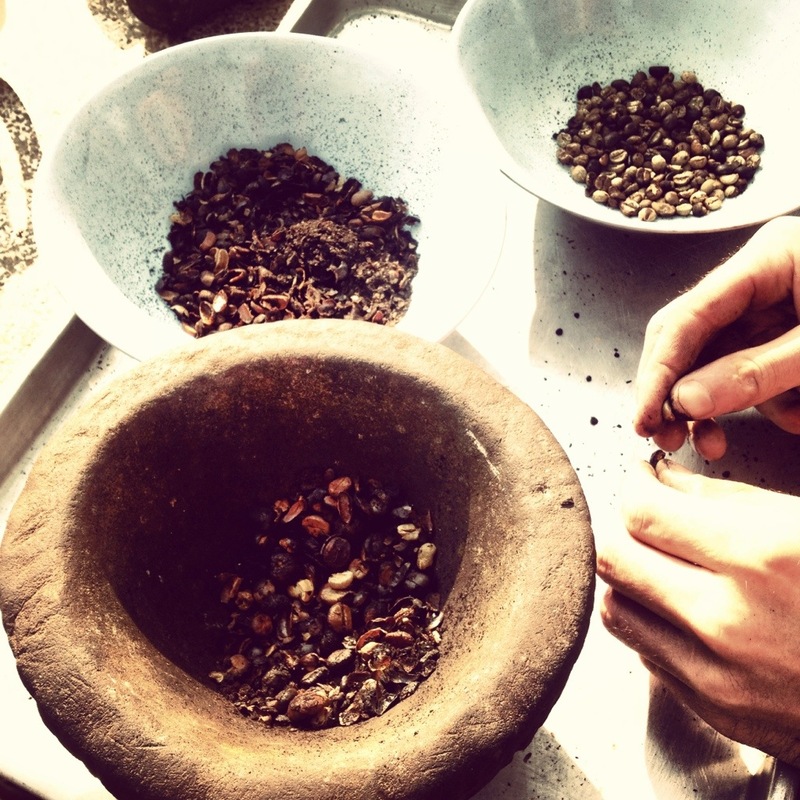 Shelling coffee beans is hard work! 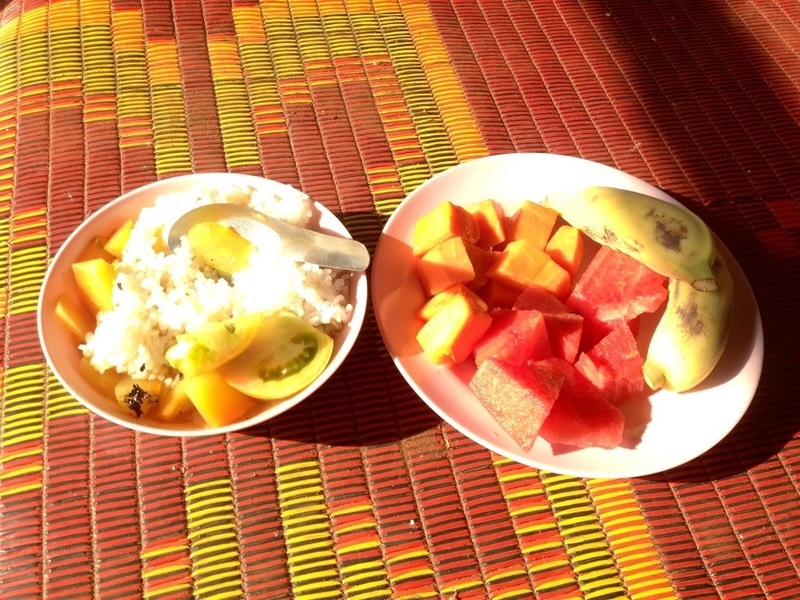 Colorful lunch of papaya, watermelon, bananas, tomatoes, and rice. 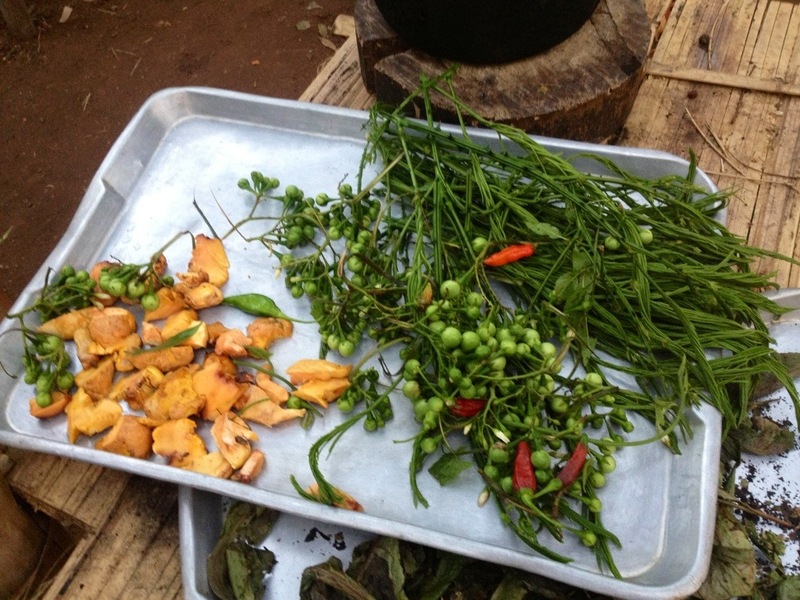 Some plants and fungi from nearby forests, foraged by Teacher Boy and Momma Suwannee. Venomous green pit viper. 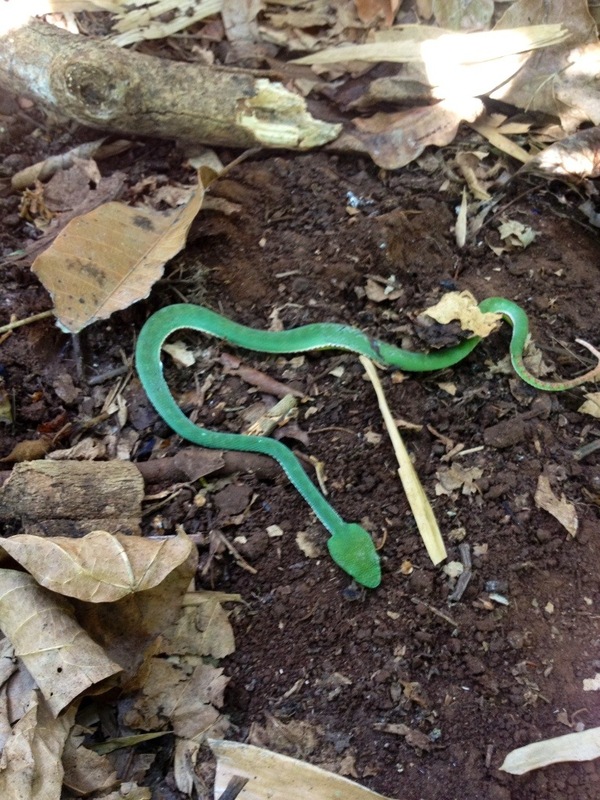 There were many poisonous snakes such as this one in the surrounding area. The boys killed it shortly after this picture was taken. Teacher Boy getting a “traditional Thai massage” by a local villager. The ladies watching Ryan roast some coffee. Little Monk, Sao and Suwannee’s youngest child. 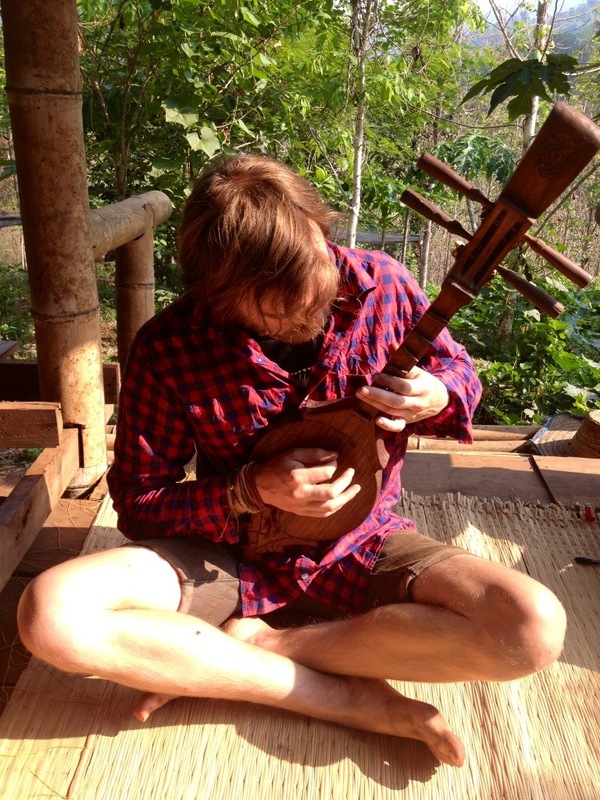 Ryan fiddling around with a Karen guitar. 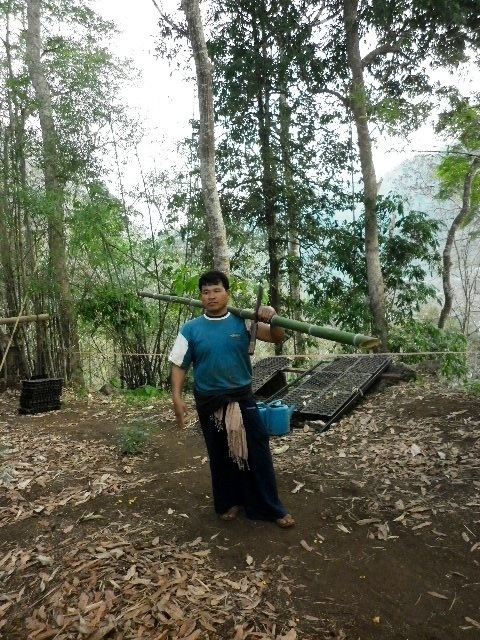 Sao washing up in the stream with his homemade bamboo shower. Lilith and Steffan relaxing and enjoying their free time. 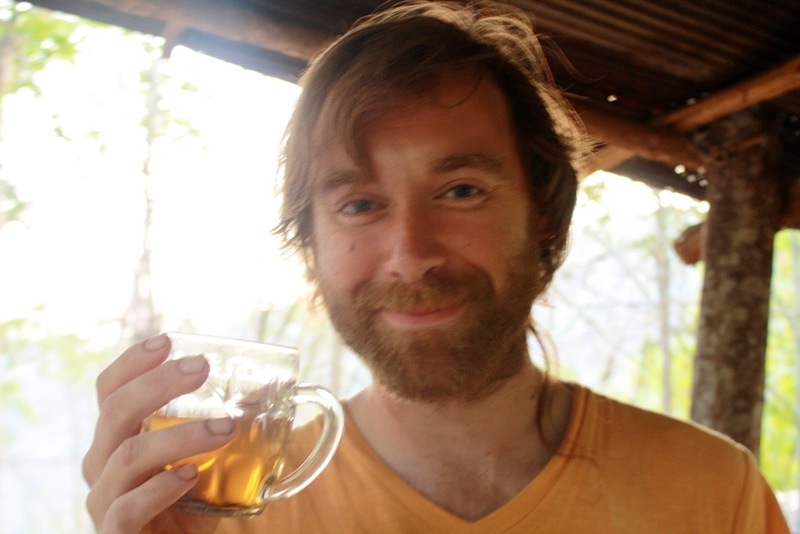 Teacher Boy elated with a cup of tea. 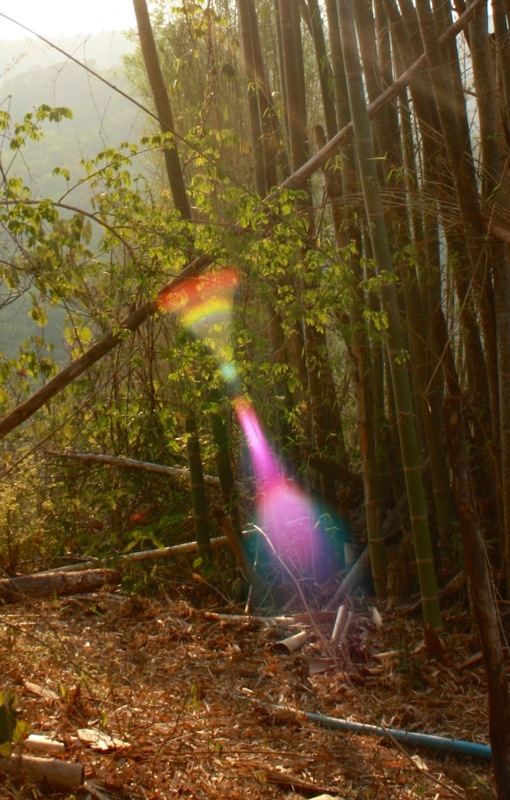 A prism of light captured in the forest. 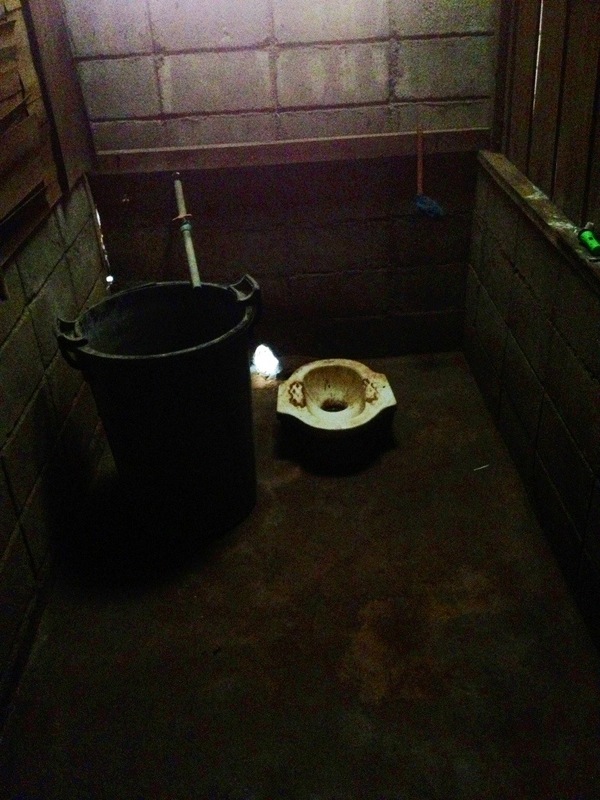 The downhill path that leads from Sao’s house to our scout house. Our view of the neighborhood. Me and Momma Suwannee, a kindred spirit. 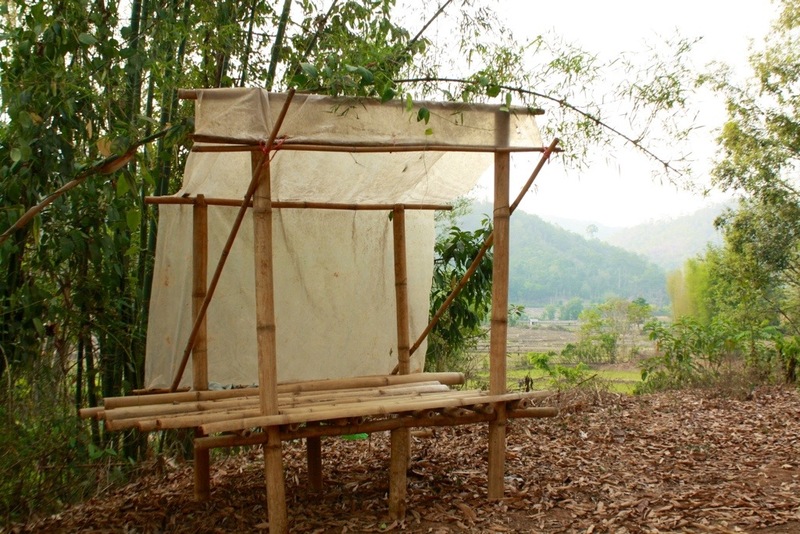 One of the bus stops in the Karen village. 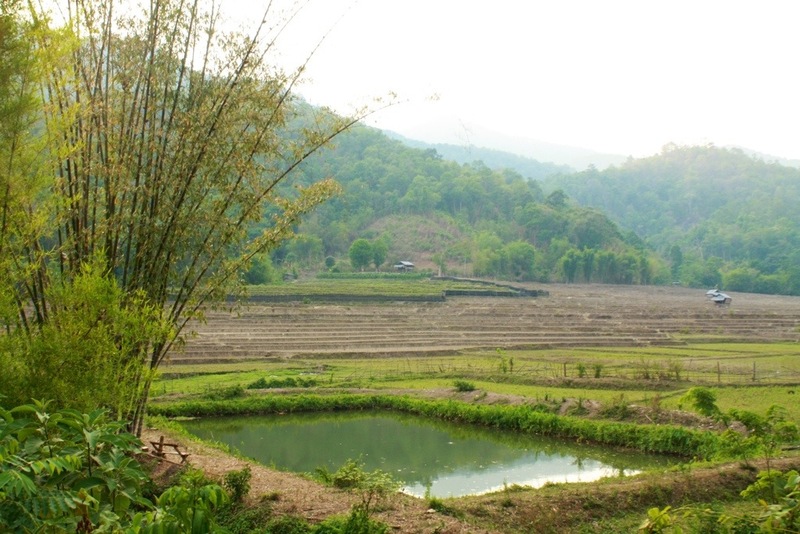 Our view of Karen farms and rice fields. Mr. Sao giving life his stamp of approval. Ben and Mr. Sao working hard in the field. 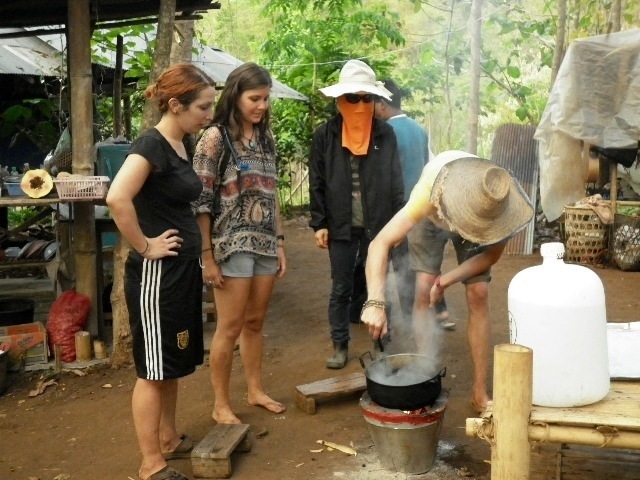 Ryan, Lilith, Anna, and Tomas making coffee. 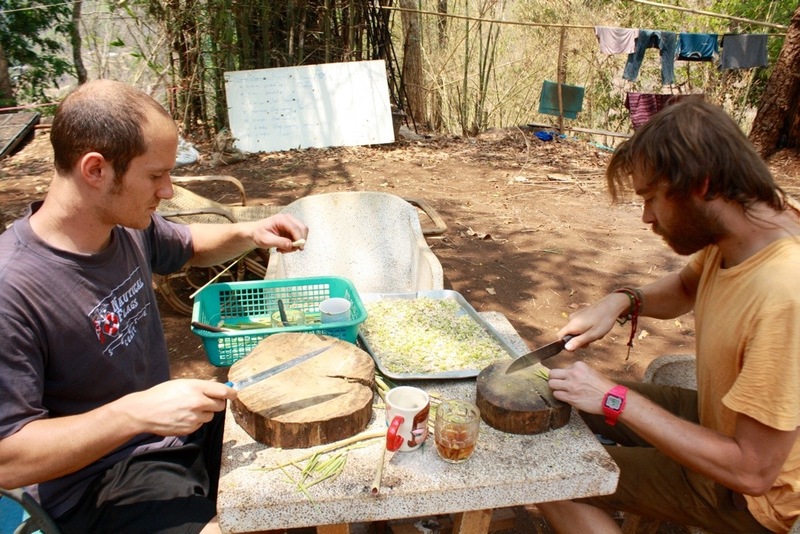 Ben and Ryan chopping lemon grass. 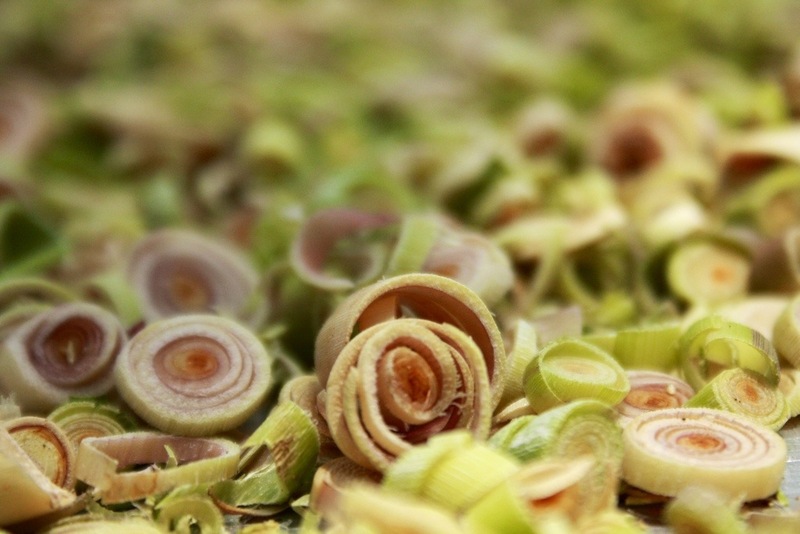 Our coffee spoils, ready for roasting. 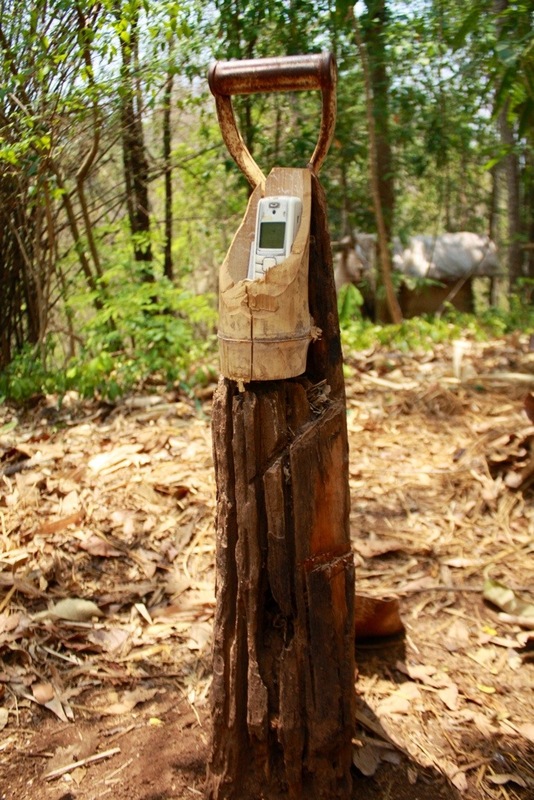 A mysterious cell phone tower constructed by Mr. Sao. For reasons unknown to any of us, this exact spot was the only place on the entire land that received service. When making or receiving calls, Mr.Sao would bend down on his knees in order to be ear level with the phone without moving it from the magic spot. 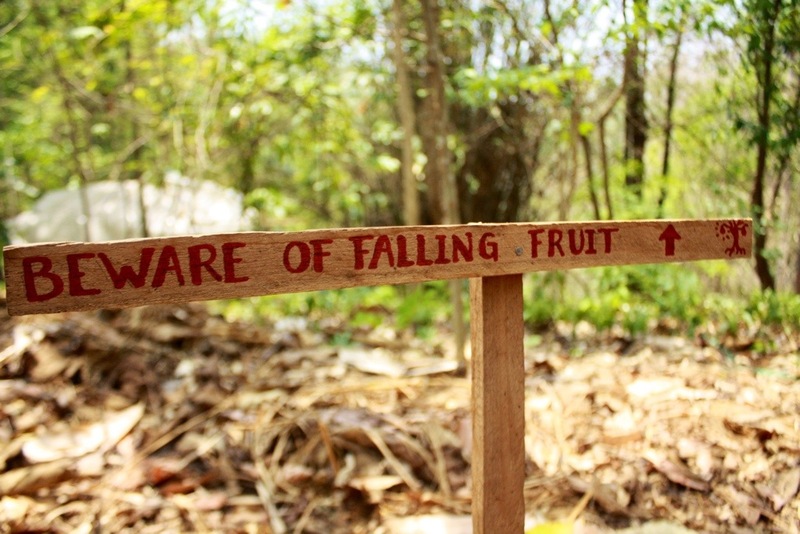 Beware of falling fruit! Probably the least of our worries. 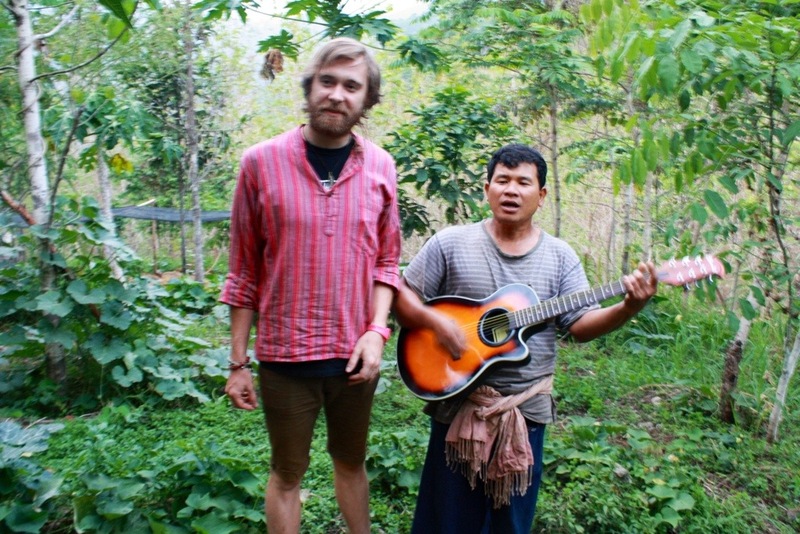 Ryan and Mr. Sao, singing a tune. Ryan learning The Way of Sao. I really liked reading this entry. 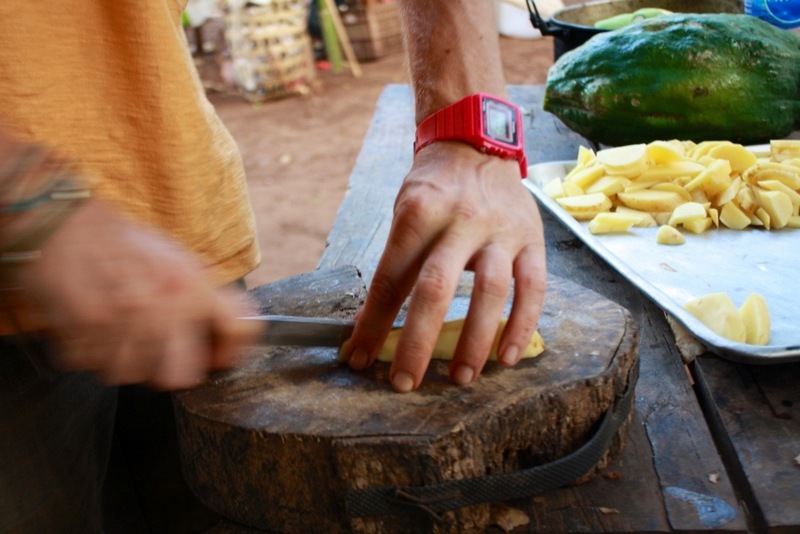 I want a tree trunk cutting board too! So do y’all eat mostly vegetarian there? I might fit in. I always worry about that if I go visit somewhere. 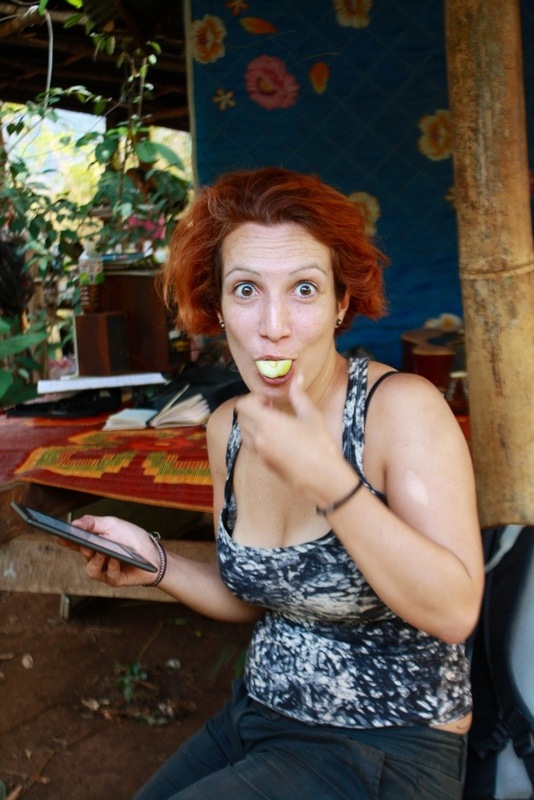 Kerstin, we didn’t eat entirely vegetarian but it was definitely an option, definitely doable. Don’t let that keep you from traveling! This is fantastic! It made my morning to hear about your latest adventure. You’re coming home sooooon! Can’t wait to see my favorite fool! An awesome pictorial of your amazing journey! Thanks for sharing. Thanks, Nate! Enjoying your photography as well. Aw, Sherry, thank you so much for your kind words and for following my blog. You’re right, my mom is awesome!